ONE of Halifax’s most distinguished sons has been honoured with a blue plaque – more than 370 years after he died. Nathaniel Waterhouse set up many local charities, including lifesaving facilities for poor people in Halifax and district, such as the the local workhouse, where residents who could not support themselves were housed and set to work and where Waterhouse served as master. In his will of 1642 Waterhouse established almshouses for 12 poor widows and a school – named the Blue Coat School after the colour of its uniforms – for 20 poor boys and girls in Causeway and Upper Kirkgate, near Halifax Parish Church. Mr Waterhouse, who became wealthy as a dealer in salt, oils and dyeing materials, left many other local legacies, including support for Halifax’s Free Grammar School of Queen Elizabeth, better known as Heath Grammar, and money to maintain local roads. In the 19th century the school and almshouses were relocated to Harrison Road, Halifax. The school closed in 1958 and the almshouses were rebuilt on the same site in 1967. Now, to commemorate Nathaniel Waterhouse as one of Halifax’s greatest benefactors, Halifax Civic Trust has installed its latest blue plaque at the now 50-year-old almshouses in Harrison Road. 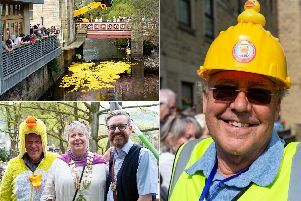 The plaque was unveiled by the Deputy Mayor of Calderdale, Coun Jane Scullion, at a special ceremony during the Halifax Heritage Festival, organised with the trustees and managers of the Waterhouse Homes. Coun Scullion told onlookers that Waterhouse’s legacy arose from his vision of a community which included provision for education, housing and roads. His sense of responsibility amounted to “good old-fashioned stewardship”, which was still important today. The event, held in the community room at the Waterhouse Homes, also included the 4th Halifax Civic Trust Annual Lecture, given by Helen Caffrey, expert and author of books on almshouses, who gave an illustrated talk on “Halifax Almshouses in Context”. She was introduced by trust chairman Dr John Hargreaves, who spoke about the life of Nathaniel Waterhouse. The clerk to the Waterhouse trustees, George Pickles, presided. The Waterhouse plaque is the twelfth to be erected by Halifax Civic Trust. Previous citizens to have been commemorated include John Crossley, founder of the carpet-making firm John Crossley and Sons at Dean Clough, Halifax; John Mackintosh, the Halifax “toffee king”; stage and screen actor Eric Portman; cats eye inventor Percy Shaw and Nobel Prize-winning geneticist Oliver Smithies. More recent plaques have honoured the Halifax sculptor Jocelyn Horner, historian E P Thompson and Halifax author and thespian Dr Phyllis Bentley. The trust also erected a blue plaque to commemorate the centenary of Halifax Town Football Club in 2011.